The “Bobby” bag is the brainchild of Dutch design firm XD Design. Its innovative take on classic backpack design combined with their custom anti-theft twist has been well received by consumers and critics alike. The original lightweight design features cut-proof fabric, hidden pockets and zippers, an integrated USB charging port and shock-proof compartments. This really is the ultimate backpack for international travel. The backpack is made from a combination of polyester and polyvinylchloride and is designed to protect your valuables and give peace of mind to the busy traveller. With its anti-cut properties it prevents access through the material while hidden zippers make it more difficult for thieves to open. With over 400,000 people a day falling victim to pick-pockets around the world, the Bobby makes it that little bit more difficult. 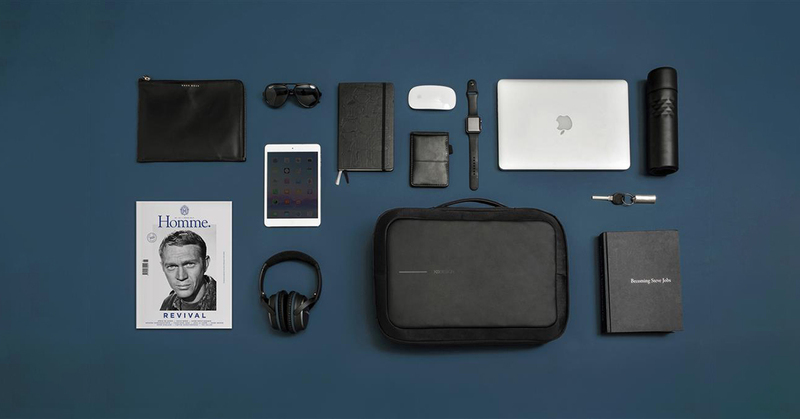 For the traveling business person it has become even more important to protect laptops, tablets and data than ever before. Not only do you risk the loss of weeks of work but you and your company have a responsibility to protect personal details and data. The Bobby Original can fit a 15.6 inch laptop as well as a 10 inch tablet and plenty of other accessories besides! You, your employees or your clients can rest a little easier on their way to their latest international conference or on a busy business trip with the extra level of security the Bobby backpack provides. If it’s the more professional look that you’re going for the Bobby Bizz briefcase is the perfect accompaniment to any business traveller. Boasting the same security and branding opportunity as the original but with an easy to carry side handle and strap storage. The Bobby bag is available to order with your branding printed in prime positions via screen transfer. With great colour quality and bulk discounts, this product is an excellent way to get your brand out there.